Four Mile Hut is located in the northern end of Kosciuszko National Park, near Selwyn Quarry. Four Mile Hut is a few kilometres gentle walk or ski from Kiandra or the Selwyn resort in the northern part of Kosciusko National Park. Built in 1937 by gold fossicker Robert Hughes, it has a colourful history. Until about 1981, there was a box of very live dynamite under the bed, presumably to give any resident silly enough to light a really big fire in the hearth, a night to remember! We in the Nordic Ski Club are privileged to be the hut’s official caretakers. 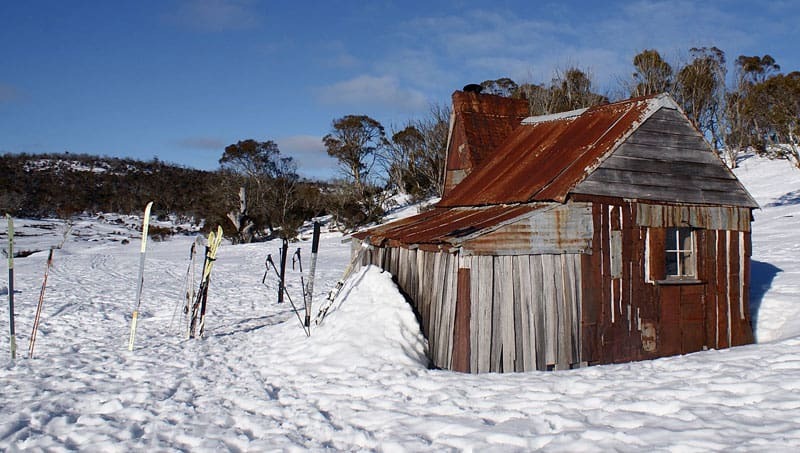 Being the last goldminer’s residence in the Kiandra gold mining area, this gem of a hut has immense heritage value and, like many other huts, is only standing today because of the efforts of many volunteers over several decades. But we have become concerned at the increasing horse damage around the hut. Feral horse sightings are now frequently being noted in the visitors’ book. It’s a new development of the last four or five years. Horse manure around the hut is now a regular feature of our visits there outside the winter season. On the last two annual maintenance weekends, we found it necessary to allocate an hour on each occasion to shovelling horse manure from around the hut to clear our working area and to prevent the manure being walked into the hut by the work party. The recently cut (by the NPWS) track which brings people for the last 3 – 400 metres through the woodland at the back of the hut is now eroding deeper into the soil and clay over which it passes. Tracks in the soil show that, though some of this erosion is due to mountain bikes, most is due to horses. We now see relatively fresh horse droppings when walking into Four Mile Hut. Both our usual routes to the hut go over and through slowly draining, delicate herb fields that are superb seasonal frog habitat. Passing through these now vulnerable areas after a rain event is something that no one would ever forget for a long time. If the wild horse population continues to increase, we are fearful that Four Mile Hut will change in the way that other parts of the park have been degraded. Instead of a delightful refuge, rich and diverse, and set in a beautiful frost hollow near a sparkling stream, it’s at risk of becoming an isolated structure in a sterile and smelly paddock. – Paul Jennings, NSW Nordic Ski Club.